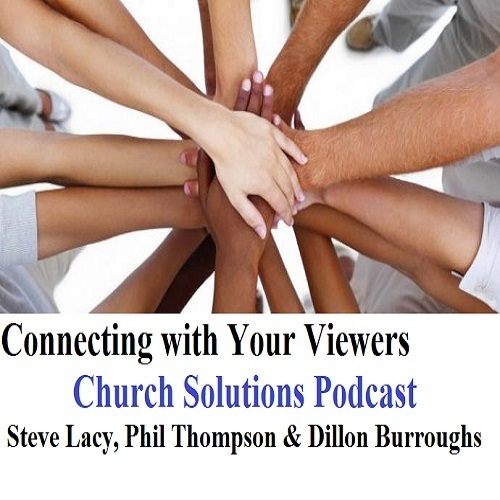 audio - Dillon Burroughs leads our discussion on ways to connect with your viewers that watch online with Steve Lacy and Phil Thompson. 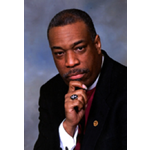 Views: 1 Video - Dillon Burroughs leads our discussion on ways to connect with your viewers that watch online with Steve Lacy and Phil Thompson. 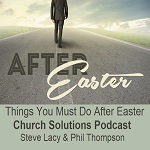 audio - Steve and Phil look at 10 things you can do right now help you pull off an excellent Easter service for your church. 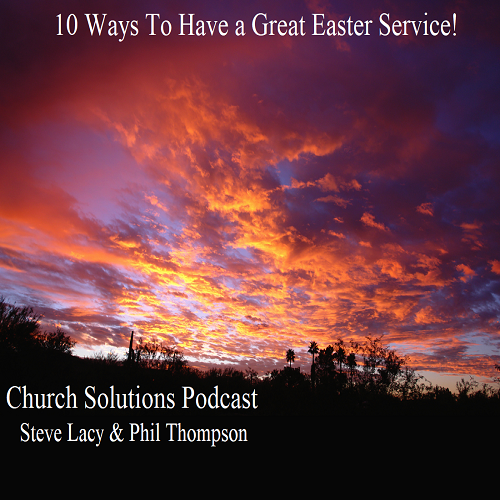 Views: 4 Video - Steve and Phil look at 10 Things You Can Do For a Great Easter Service for your church! 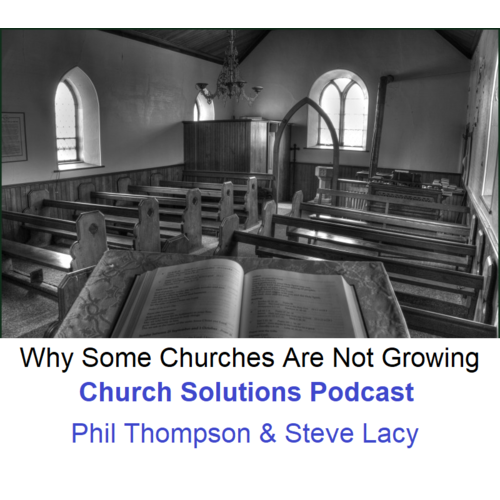 Audio - There are reasons churches are not growing and Phil Thompson & Steve Lacy share reasons and answers. 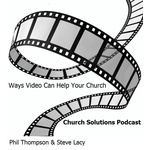 Views: 13 Video - Some churches don't grow for many reasons, Phil and Steve look at 10 reasons and how you can change in this edition of the Church Solutions Podcast. 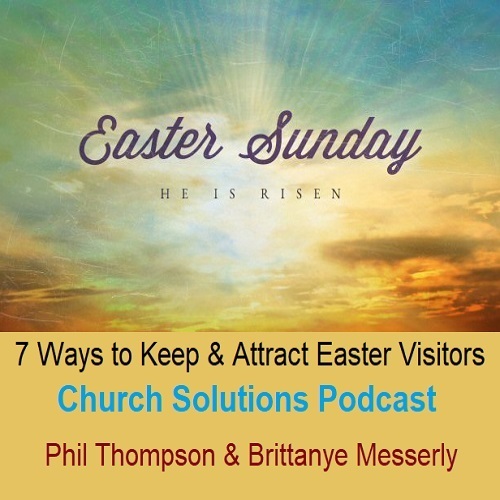 Phil and Brittanye bring 7 ideas to attract and keep Easter visitors to your church. Go to https://mailchi.mp/streamingchurch/easter-webinar for our free webinar now to sign up! 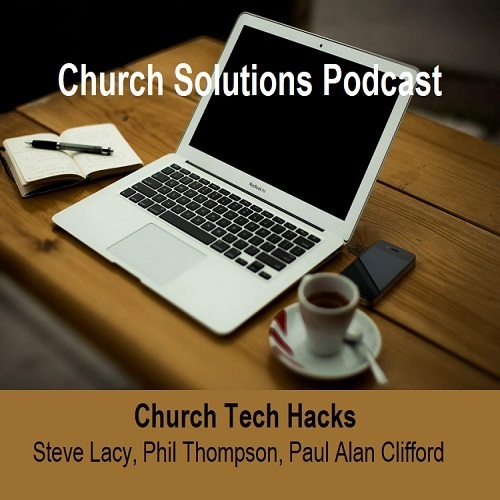 Audio - Phil and Steve explore 15 tech related ideas you can do to connect with tech savvy people in church. 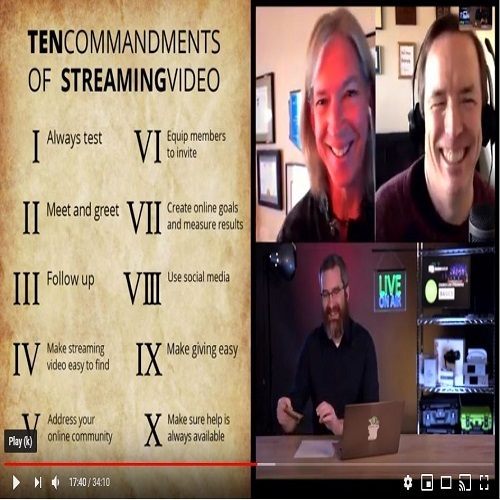 Views: 23 Video - Phil and Steve explore 15 tech related ideas you can do to connect with tech savvy people in church. 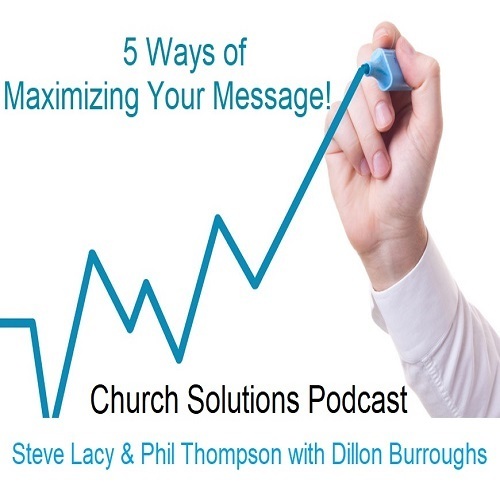 (audio version)Steve and Phil talk with author and media expert Dillon Burroughs about maximizing your sermon. 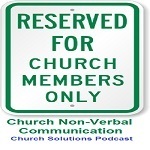 Views: 33 (video) Steve and Phil talk with author and media expert Dillon Burroughs about maximizing your sermon. 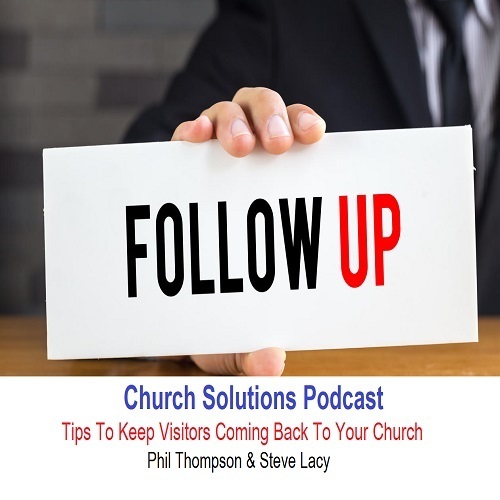 Audio -Phil Thompson and Steve Lacy look at the importance of first time visitor numbers and we as follow up on this edition of the Church Solutions Podcast. 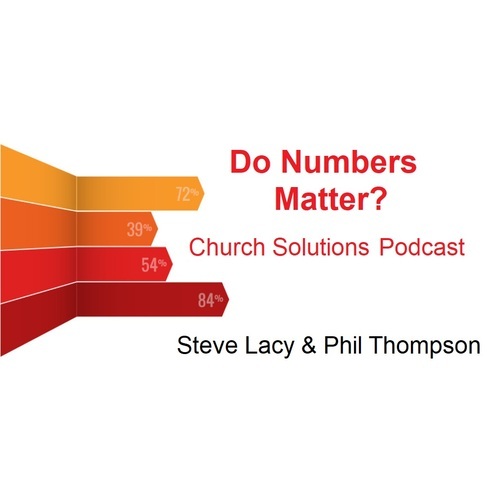 Views: 38 video- Phil Thompson and Steve Lacy look at the importance of first time visitor numbers and we as follow up on this edition of the Church Solutions Podcast. 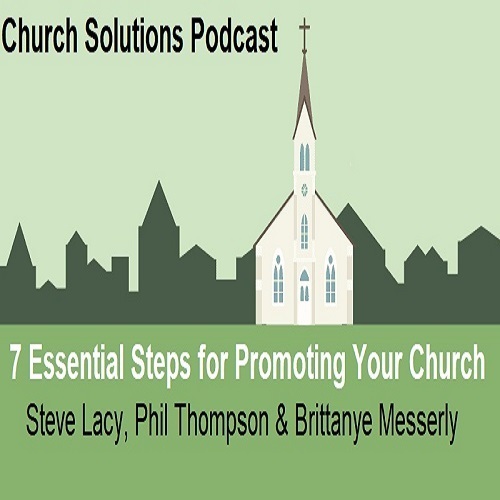 Steve and Phil speak with marketing expert Brittanye Messerly about 7 essential steps to promoting your church and reaching more people. 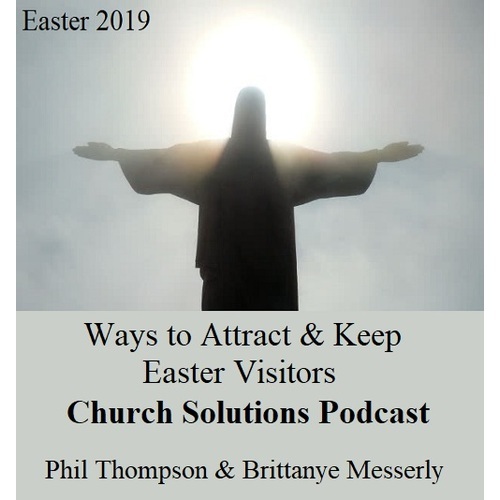 Views: 46 Steve and Phil speak with marketing expert Brittanye Messerly about 7 essential steps to promoting your church and reaching more people. 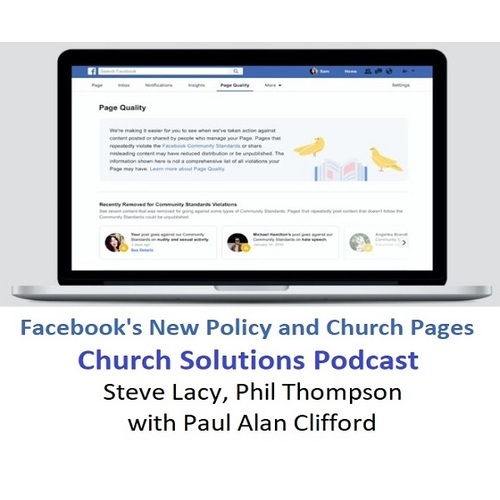 Steve and Phil speak with Paul Alan Clifford about Facebook's new policy and how it could effect church Facebook pages and why you should be concerned. 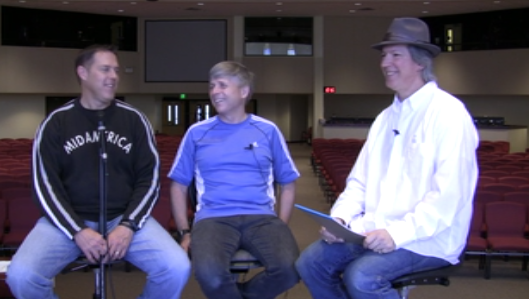 Steve Lacy and Phil Thompson are guests at Epiphan TV and discuss streaming video for churches with George Herbert. 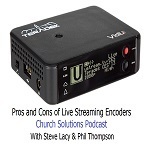 The Webcaster X2 is talked about as well as a great option for churches. Views: 46 Steve Lacy and Phil Thompson are guests at Epiphan TV and discuss streaming video for churches with George Herbert. 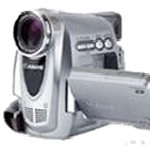 The Webcaster X2 is talked about as well as a great option for churches. 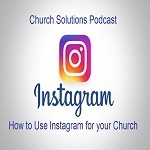 Phil and Steve speak with Terrell Sanders, church social media expert about how churches should be using Facebook more effectively. 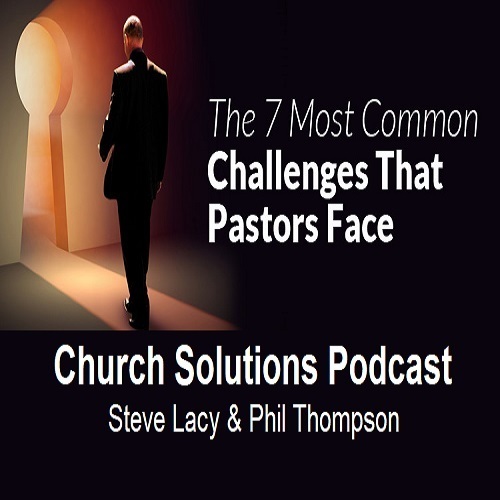 Steve and Phil look at some common challenges pastors face in ministry today and offer some solutions. Reach more people! 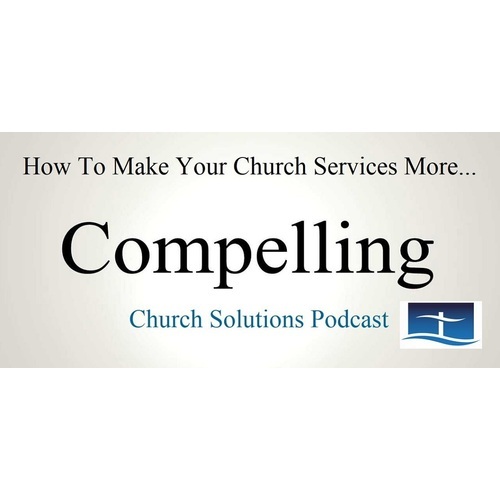 Phil and Steve look at some ways to create compelling church services for 2019. Steve and Phil interview George Herbert about the Webcaster X2 from Epiphan Video for streaming video purposes. 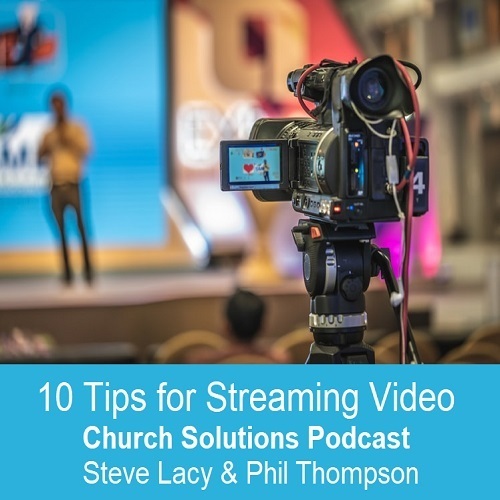 Phil and Steve share ten tips and more for streaming video for churches. 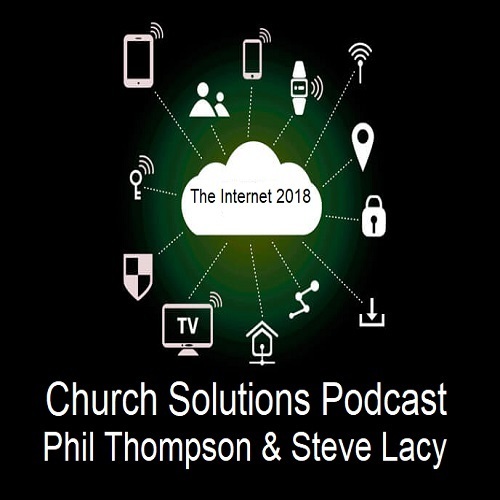 Phil and Steve look at detailed stats on Internet use from the past ten years and why you should care if you are involved in your church. Phil and Steve talk about how it takes more than positional authority to effectively lead others and create a healthy team environment. 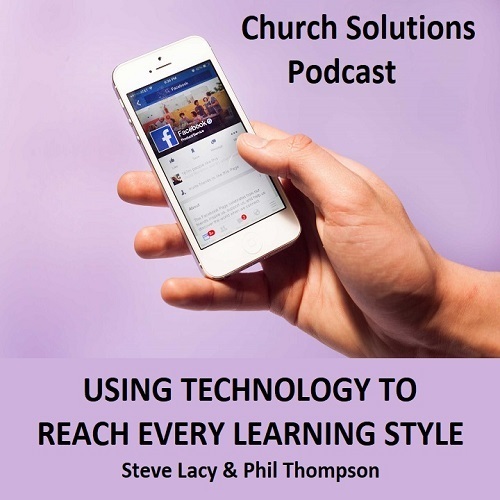 Phil and Steve look at different technology tools used to help those in your church learn better. 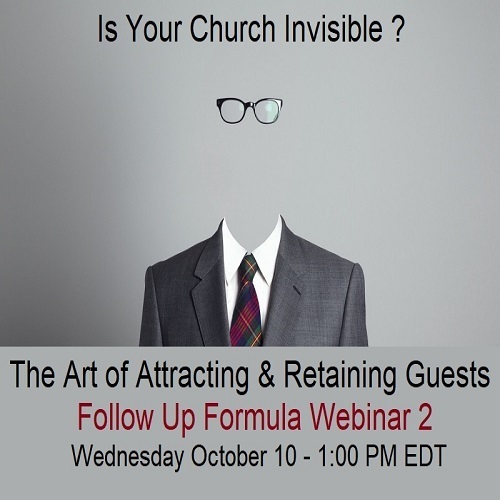 Turn your members into inviters is the topic in our 4th webinar on Follow Up for Churches. 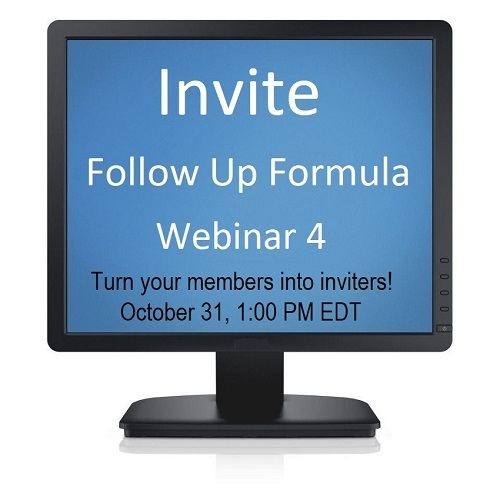 Craig Smee leads us in this insightful webinar. 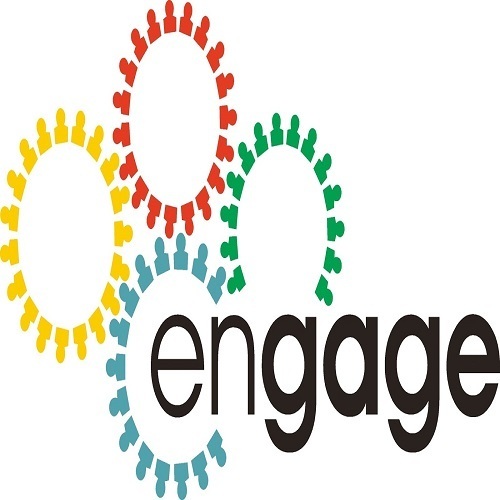 Views: 66 This 30 minute live webinar with Pastor Craig Smee will help you engage your guests so they become committed members involved in small groups, serving and tithing. Craig, as well as Steve Lacy and Phil Thompson, will also be available to answer questions at the end of the presentation. 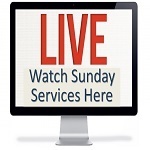 This 30 minute live webinar with Pastor Craig Smee will help you engage your guests so they become committed members involved in small groups, serving and tithing. Craig, as well as Steve Lacy and Phil Thompson, will also be available to answer questions at the end of the presentation. 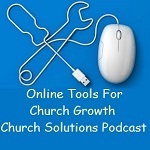 The majority of folks are using the most popular digital tools, Facebook, Twitter, Instagram, etc... Is your church equipped to be found on these important platforms? Pastor Craig Smee will show you how to leverage all your digital resources so new people will be attracted to what your church has to offer. 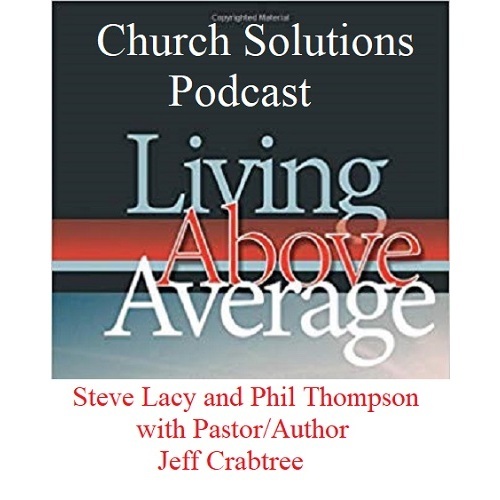 Steve and Phil interview Pastor/Author Jeff Crabtree and discuss the challenges and solutions for those involved in ministry. 2018/05/09 Who is Steve Lacy? 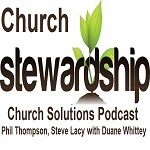 Duane Whittey shares what you need to know about Church Stewardship Campaigns for your ministry with Phil and Steve on this Church Solutions Podcast. 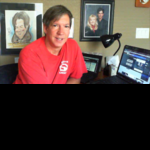 Views: 164 Phil and Steve host this webinar from April 17, 2018 on streaming video. 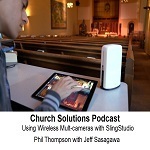 Phil Thompson interviews Jeff Sasagawa from SlingStudio about using the wireless multi-camera equipment for church streaming. 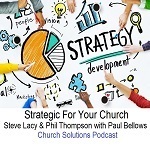 Being strategic in the way you reach people will make a difference as Paul Bellows explains to Phil and Steve in this Church Solutions Podcast. 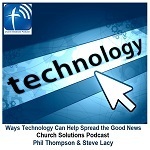 Phil and Steve look at ways technology can help spread the Good News. Steve Lacy and Phil Thompson give 10 steps to take for a successful streaming experience. 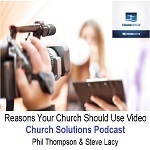 Phil and Steve share the benefits of using more video for your church. 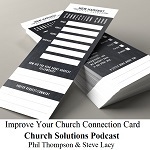 Phil and Steve look at ways to improve your ability to connect with those attending your church with connection cards. 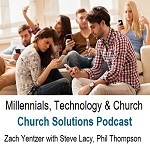 Author Zach Yentzer returns to talk about millennials and tech and how the church can reach them effectively. 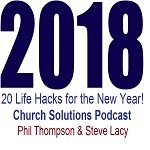 Phil and Steve share some valuable things to help your New Year get off to a positive start! 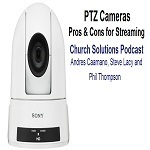 Andrew Haley from Telestream talks about the features of Wirecast for churches and streaming video with Phil Thompson and Steve Lacy on the Church Solutions Podcast. 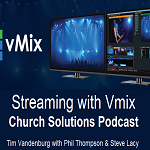 Tim Vandenburg is the chief operating officer of vMix, live production and streaming software encoder with its roots in serving church organizations. 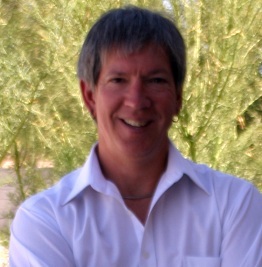 David Drum from 4Tucson talk with Steve and Phil about ways to overcome poverty in your city. 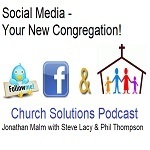 Author Jonathan Malm joins Steve and Phil to talk about the new congregation for church, social media. 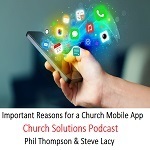 Steve and Phil point out some important reasons your church should consider having a mobile app. 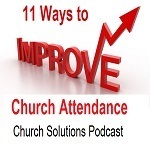 Phil and Steve share 11 things that can help increase your church attendance. Steve and Phil review some common mistakes made in multi-media presentations and how to avoid them. Zach Yentzer wrote the book, Creative: Designing Churches That Engage Generations Together. 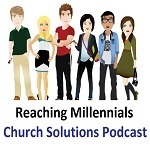 Zach shares ideas on how the church can reach millennials. Signs of Spiritual Abuse may be more common than you think. Phil and Steve discuss this important topic. 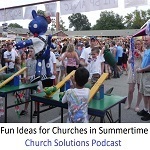 David Drum shares how change can happen in your community when Christians work together. 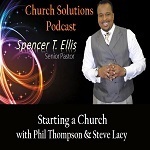 Steve and Phil interview Pastor Spencer Ellis from Citadel of Praise, from inner city Detroit. 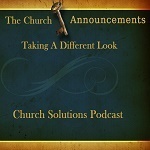 Pastor Ellis shares his thoughts on starting a new church. 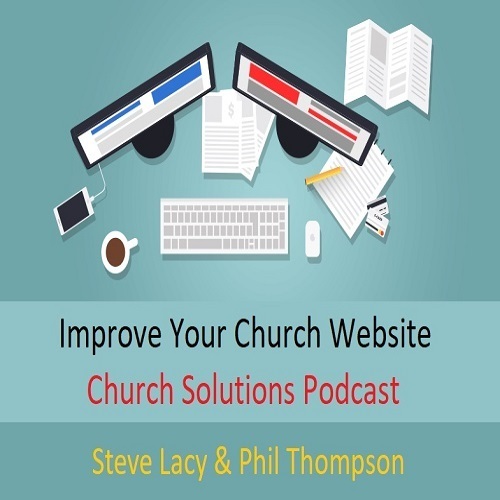 Steve and Phil look at tips to improve your church website. 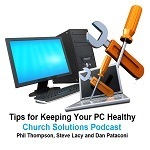 Phil and Steve speak with Dan Pataconi from FireProof Computers Services about keeping your PC healthy. 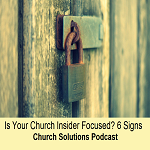 Phil and Steve look at 6 signs your church might be insider focused and how to change. 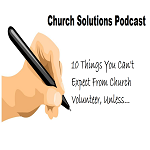 Phil and Steve look at ten things you can't expect church volunteers to do without some of these important tips. Outline by Ryan Holck. 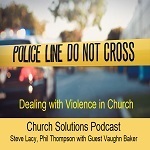 Vaughn Baker, president of Strategos International, shares about church security and how we can protect our people with Phil and Steve. 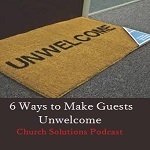 Steve and Phil share 6 ways we sometimes make visitors to our church feel unwelcome. 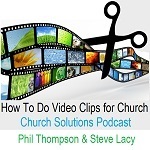 Phil and Steve talk about why and how to use video clips fr church presentations. 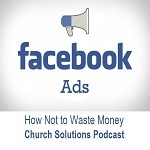 Phil and Steve look at ways to use Facebook ads to promote your ministry and save money at the save time. 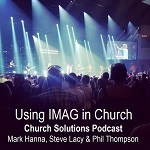 Mark Hanna from FxN Productions.com speaks to Phil and Steve on the subject of IMAG, should your church do it? 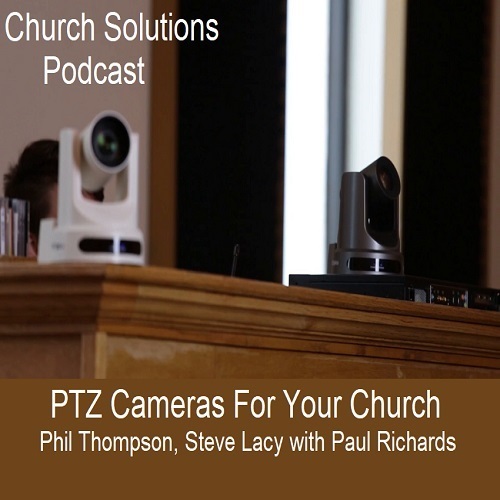 Phil and Steve discuss PTZ Cameras with Andres Caamano, from Worship Tech Director. 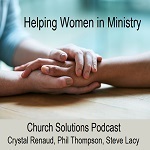 Phil and Steve speak with Crystal Renaud, a Life Coach who specializes in coaching and helping women involved in ministry. 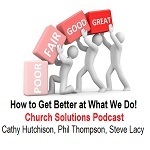 Cathy Hutchison from Idibri joins Phil and Steve in the helpful discussion on how we can personally improve what we do, for those involved ministry. 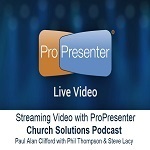 Phil and Steve share insights on how to get more viewers for your streaming video. Steve and Phil look at live encoders for streaming video. 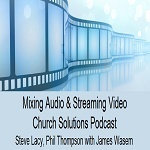 Audio engineer James Wasem shares tips on mixing audio and streaming video with Phil and Steve on the Church Solutions Podcast. 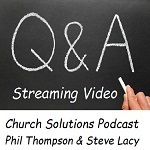 Steve Lacy and Phil Thompson answer questions about streaming video for church. 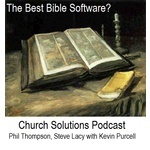 Kevin Purcell is an expert when it comes to Bible software. Steve and Phil discuss with him the different kinds of software available and which are the best. 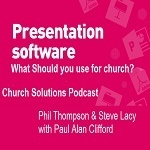 Church Tech guru and published author Paul Alan Clifford joins Phil and Steve as they talk about presentation software for church? 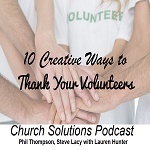 Lauren Hunter, Founder and Editor of Church Tech Today, talks with Phil and Steve about ways to show gratitude to volunteers. 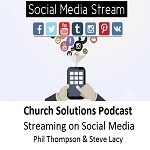 Steve Lacy and Phil Thompson discuss other platforms your church can stream to, like Facebook, YouTube and more. 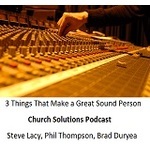 Brad Duryea, audio engineer from Lakewood Church, (home of Joel Osteen), shares his wisdom on what makes a great sound person with Steve Lacy and Phil Thompson. 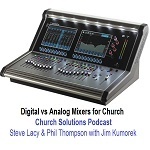 Jim Kumorek from Spreading Flames Media lends his expertise when it comes to digital and analog mixers for your church. 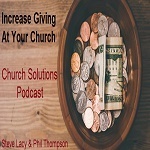 Phil and Steve look at some interesting stats regarding giving at church and how to increase donations. 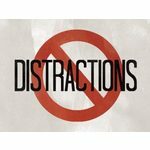 Phil and Steve look at the numerous distractions that can happen during your church service and share tips on how to prevent them. 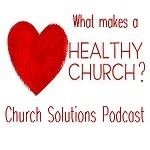 2016/12/01 What Makes a Healthy Church? Phil and Steve explain 7 steps on producing your own podcast. 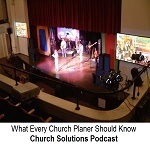 Greg Atkinson is the executive director of ExPastors.com and discusses how is organization helps former as well as current pastors in dealing with issues they face. 2016/10/12 Is Life Coaching For You? 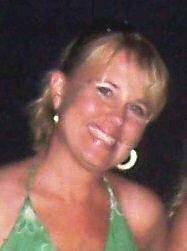 Clay Arnold is a Master Life Coach and founder of Heart Life Coaching DFW. 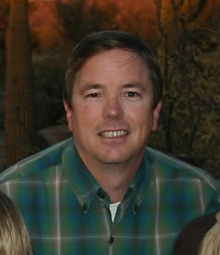 He is the author of Power 2 Live Tools for a Great Life. 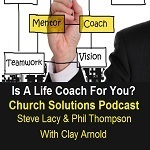 Phil and Steve ask questions about life coaching in this Church Solutions Podcast. 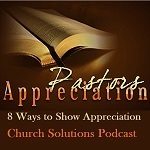 Views: 1 Phil and Steve share eight ideas on how your church can show appreciation for your pastor during Pastor Appreciation month. 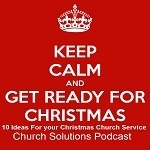 Phil Thompson and Steve Lacy discuss 10 ideas for getting ready for your Christmas service. 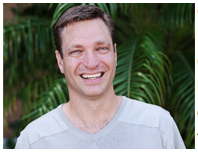 Steve and Phil talk with Dana Byers, author of Become Your Own Personal Assistant about finding simplicity and peace in our busy life. 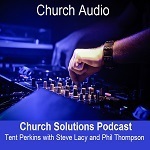 Steve and Phil talk with Kevin Jones from Portable Church about solutions for church planters and multi-site churches. 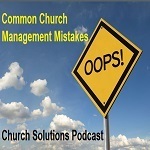 Steve and Phil speak with Jonathan Malm, auther of Unwelcomed: 50 ways churches drive away first time visitors. 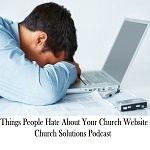 Things People hate About Your Church Website is a collection of things Phil Thompson and Steve Lacy have noticed over the years of working with ministries. 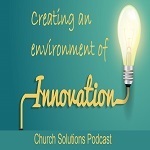 Steve Lacy and Phil Thompson speak about ways to make your church more innovative. 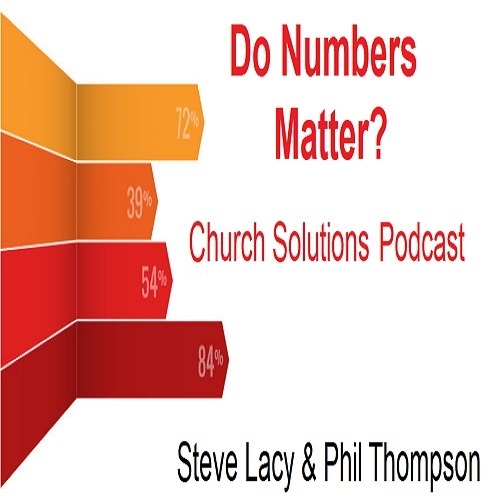 Phil Thompson and Steve Lacy look at some interesting statistics on the use of technology by churches. 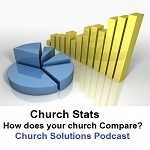 How does your church compare? 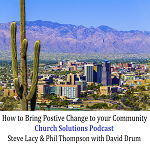 Phil Thompson and Steve Lacy talk about reasons why people do not give to church and how to change that in a positive way. 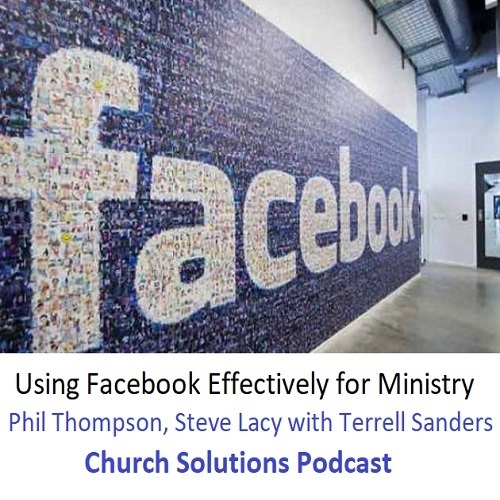 Steve Lacy and Phil Thompson give details on how you can use Facebook to grow your church. 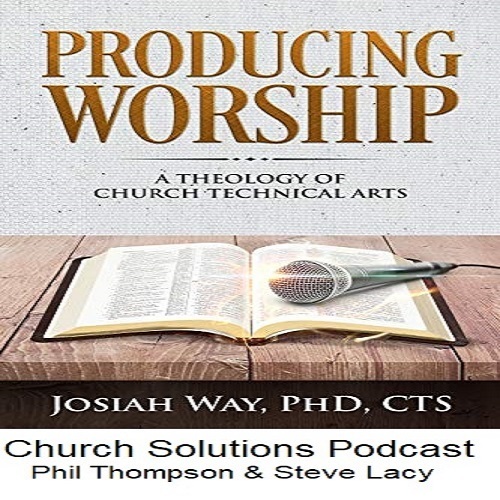 Steve Lacy and Phil Thompson present some ideas on how you can increase attendance for your church using some online tools. 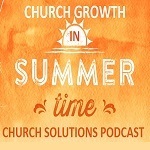 Phil Thompson and Steve Lacy discuss church growth in the summer and share tips on how it is possible. 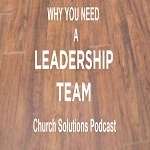 Phil Thompson and Steve Lacy talk about why a leadership team is important for your church and how to make sure you have a healthy one. 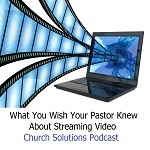 Steve Lacy and Phil Thompson discuss streaming video and what your pastor needs to know. 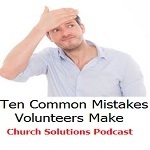 Steve Lacy and Phil Thompson share ten common mistakes church volunteers make when it comes to handling new people visiting your church. 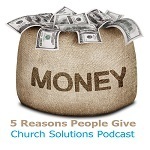 Steve Lacy and Phil Thompson share 5 main reasons people will donate to your ministry. 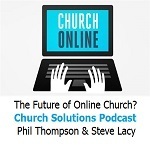 Steve Lacy and Phil Thompson discuss the future of church and how technology could vastly affect it. 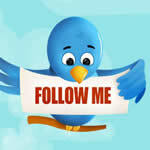 Phil Thompson and Steve Lacy take a look at twitter and why your church should consider using it to reach people. 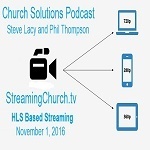 Phil Thompson and Steve Lacy talk about how you can gain more viewers to your streaming video events. 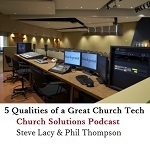 Phil Thompson and Steve Lacy share some important technology tools all churches should have. 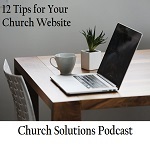 Steve Lacy and Phil Thompson share some ideas on things you can place on your church website to help people connect better with your ministry. Phil Thompson and Steve Lacy look at several live encoders for streaming video along with the pros and cons of each. 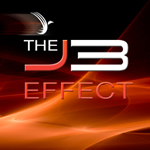 Steve Lacy and Phil Thompson explain why blogging is important and how you can write an effect blog. 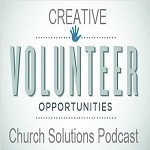 Phil Thompson and Steve Lacy have some valuable ideas on how to get more volunteers involved in your church. 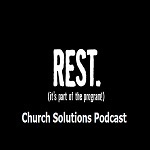 Phil and Steve talk about the misunderstanding church leaders have about resting and why it's very important to make time for rest. 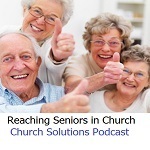 Reaching the senior generation in your church. 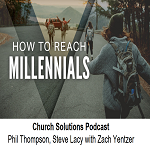 Phil and Steve share some ideas on how to make the older generation feel more connected in your church. 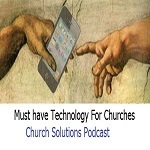 Steve and Phil look into the future of technology with the church. Steve and Phil share reasons why we fail in certain projects and how to prevent it. Steve and Phil share tips on making plans for the New Year. 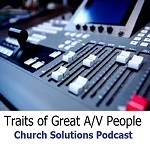 Steve and Phil look at 9 traits of great audio/video people for your church. 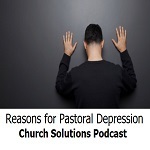 Steve and Phil discuss some reasons for pastoral depression and anxiety and how to help. Here are some tips from Steve and Phil on reaching millennials. Here is your Christmas Eve Services Check list to prepare for the big night with Steve Lacy and Phil Thompson of Church Solutions Podcast. Steve and Phil unveil a new product called Greeter.Church that will help you church connect with more people! 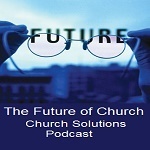 2015/11/12 The Future of Online Church? 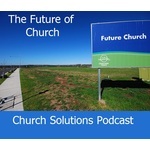 What's the future of online church? 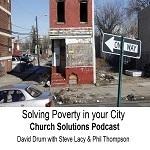 Steve and Phil look at the possibilities in this church solutions podcast. 2015/11/04 What Is Simulated Live? Steve and Phil interview Craig Smee from The Pointe in Ca. about simulated live streaming. 2015/10/29 Is Your Website Good Enough? 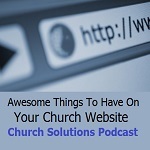 Is your church website good enough to reach people and connect your members? Phil and Steve share some ideas on how to make your website better. 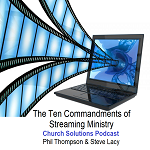 Seven trends of successful churches that stream their services online with Steve Lacy and Phil Thompson. 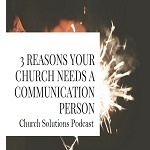 Your church probably has some non- verbal communication going on in different areas. Phil and Steve share what some of those could be and how to improve them. Here are 6 ways you make your visitors feel unwelcome when they come to your church. 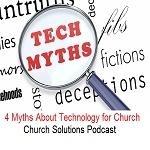 Here are some very important qualities of a great church tech person. 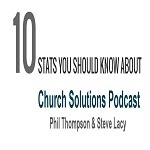 Phil Thompson and Steve Lacy share 10 stats regarding church and technology. 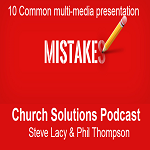 Phil Thompson and Steve Lacy talk about the importance of small groups for churches and how to be successful. 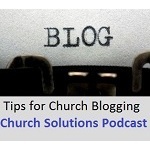 Blogging is a good thing for your church. 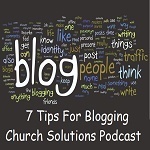 Steve and Phil share some helpful tips on how to be a better blogger. 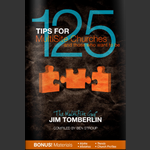 5 Easy Church Bulletin Announcement Strategies. 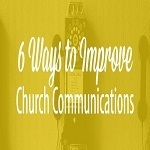 Ideas on how to better communicate info to your church members and visitors. Here are some great ways video can help your church gain and retain people! 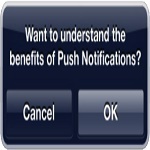 Here are some creative ideas to use for push notifications with your mobile app. 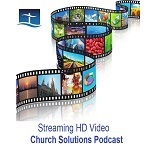 Phil Thompson addresses common problems churches experience when doing streaming video and how to solve them. 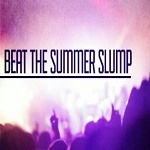 Phil and Steve give 5 ways to beat the giving slump most churches experience in the summertime. 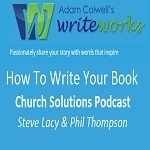 Steve and Phil interview Adam Colwell about the process of writing a book. 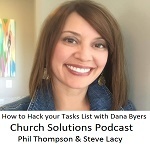 Steve and Phil talk about ways you will slow down the momentum of folks using your church app unless you do several important things. 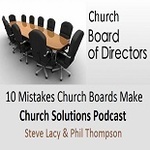 Steve and Phil look at 10 mistakes church boards can make when leading a church. 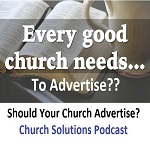 Phil and Steve talk about church advertising and things to consider. 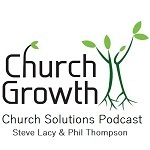 Phil and Steve share some important principles when it comes to hiring for your church. 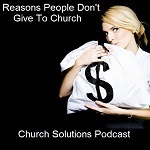 Phil and Steve discuss reasons your church needs to pursue mobile giving. 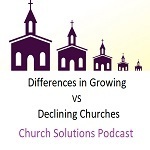 Phil and Steve talk about the shift in culture and why your church needs to keep up with it. 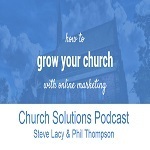 Phil and Steve talk about the importance of a person in your church to be an online host or director. Phil and Steve define what an Experience Director is and why you should consider having one for your church. Steve and Phil share information on video capture devices for streaming video. Steve and Phil share an alternative to Windows operating system - Ubuntu. 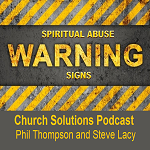 Steve and Phil share 5 signs of spiritual abuse. 2015/03/11 Free Wifi or No Wifi? Phil and Steve debate the topic of offering free wifi or not at your church. Steve and Phil talk about easy ways you can reduce stress in your life. 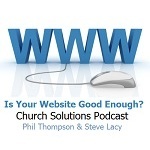 Steve and Phil share ten things you can do to make your website better. Phil and Steve share a helpful tool that can energize and help your volunteers to be a more productive part of your ministry. 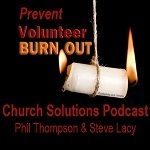 Steve and Phil talk about using software to schedule and organize your volunteers. 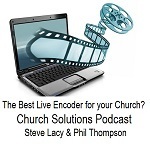 Phil and Steve talk about the importance of making and using short videos for your church and ministry. 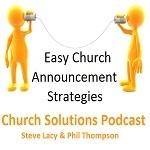 Phil and Steve talk about traits to look for in church administrative assistant. 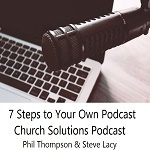 Steve and Phil share part one of how to do a podcast for your church. Steve and Phil take a look at Newteks Tricaster models for live streaming. Steve and Phil continue their review of live streaming encoders in part 3. They look at Open Broadcaster as well as Vidblaster. 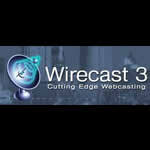 Steve and Phil review Wirecast live encoder in part two of live encoders. Steve and Phil discuss live streaming encoders, today its the Adobe Flash Live Encoder in part one of three. 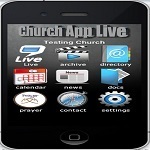 Phil and Steve share ways mobile apps can enhance your ministry. 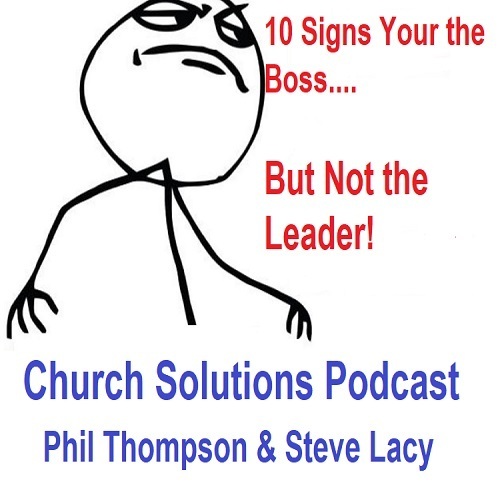 Phil and Steve share 10 signs that your ministry might be unhealthy. Steve and Phil share 8 tips on how you can get more young people involved at your church. 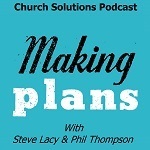 Steve and Phil share 10 ways to get people involved in your church. Steve and Phil share 3 ways you can increase your online donations by improving your giving page. Steve and Phil share 6 ways you can use Facebook to reach new people for your church. 2014/09/25 Is Never Off-Line Good? 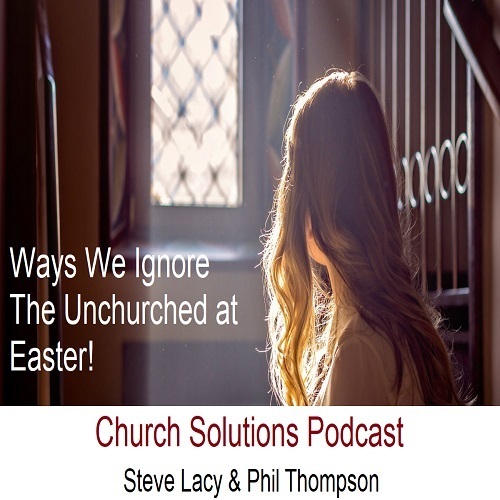 Steve and Phil share some stats and thoughts regarding the question, Is Never Off-Line Good for you and your church? 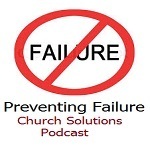 Steve and Phil talk about how to use failure for your benefit. 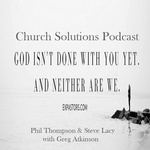 Steve and Phil talk about why you should really consider having more than one service for your church. 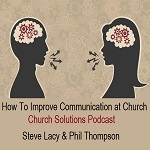 Phil and Steve discuss the importance of sound in your church and how to improve it. 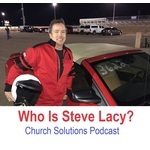 Steve and Phil discuss the job description of the online pastor and ways to expand your online presence. 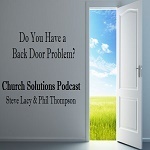 Steve and Phil discuss the serious subject of depression and provide some solutions for pastors and ministry workers. 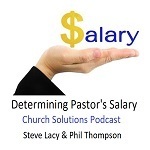 Phil and Steve speak from experience on how to increase the giving for your ministry. Steve and Phil share some free tech tools that can help you bust out of the summer slump and connect with your volunteers! 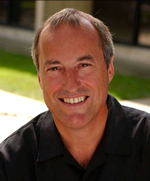 6 things that will help bring new folks back to your church by Phil Thompson, Steve Lacy. Steve and Phil share 11 tips on how to have a great leadership team. 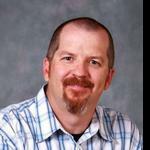 Phil Thompson gives some tips on reducing stress for those involved in ministry. 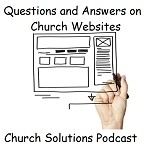 Steve and Phil discuss the pros and cons on for a church having a responsive website, mobile site, or mobile app and which is better. 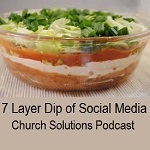 Steve and Phil give advice on choosing the right social media for your ministry. 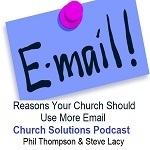 Steve and Phil share important tips on how to build a better church newsletter. Steve Lacy and Phil Thompson compare SD and HD streaming and discuss which one may be right for you. 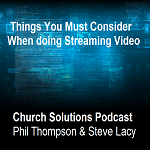 Steve Lacy and Phil Thompson discuss how to do streaming video for your church on a budget. 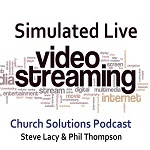 Steve Lacy and Phil Thompson share why and how you can make your church services interactive. 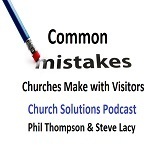 Steve Lacy and Phil Thompson share tips on attracting and keeping visitors to your church. Steve Lacy and Phil Thompson discuss some tips on recruiting the right tech team volunteers and how to keep them. Phil Thompson shares about the other things we do. 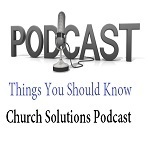 Views: 120 Phil and Steve talk about some new church apps now available. Views: 96 Phil chats with Dan from Fireproof Computer Services about common issues people experience with their pc as they stream. 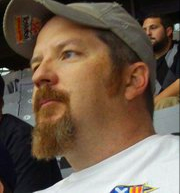 Views: 73 Phil Thompson answers more of your questions about streaming. 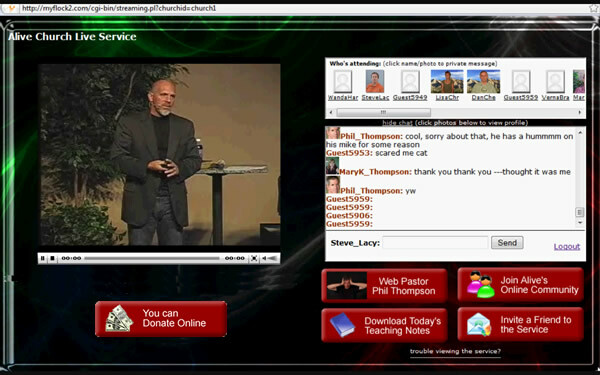 Views: 100 Phil Thompson from StreamingChurch.tv answers viewers questions regarding streaming online and apps. Views: 82 Michael Gray explains how to use social media to its fullest potential for your church. Views: 121 Phil and Steve talk about the roles of a web pastor. 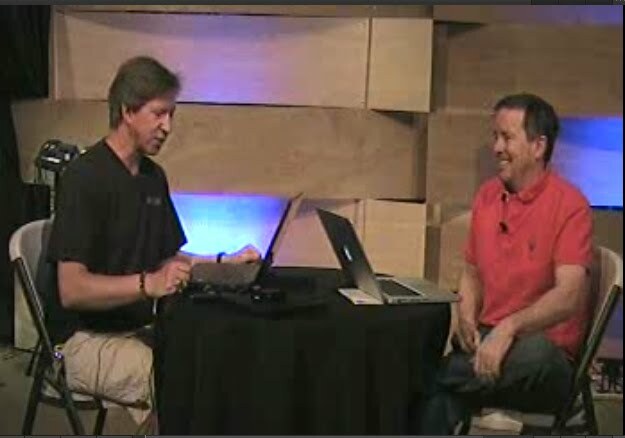 Views: 88 Steve and Phil discuss online small groups and the new StreamingChurch.tv phone app. Views: 97 Steve Lacy and Phil Thompson talk about how to get and keep more viewers with your live stream. 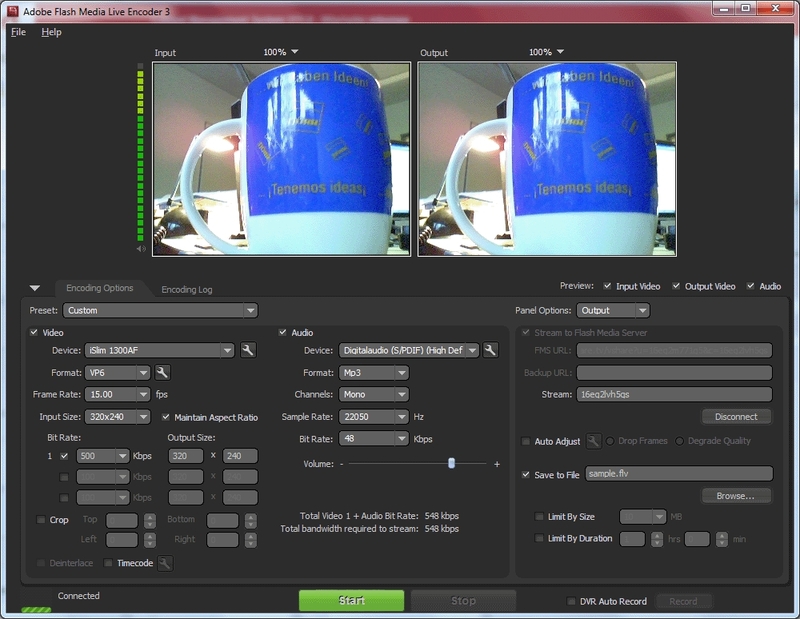 Views: 222 Steve and Phil show you how to set your streaming encoder for best results. Views: 204 Phil Thompson interviews senior Pastor Craig Coulter and media director Larry Vinyard. Views: 212 Phil Thompson shares his interesting background and how that led him to what hes now doing. 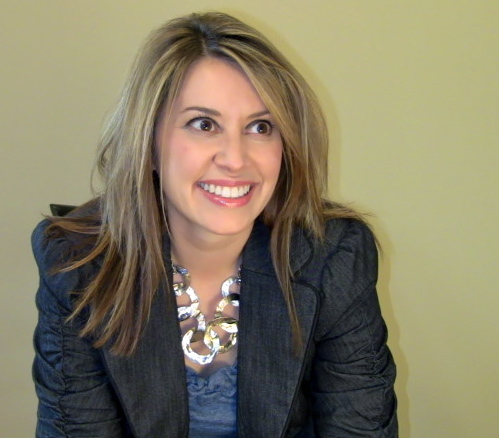 Views: 249 BlueDoor.tvs Dana Byers talks about effective ways to conduct ministry online.